Paisley Evolution in the shop! For sale: original art by Jules. But the observant among you will have noticed, the last image is the very same one featured on this page where I casually talk about painting paisleys. I actually have a book where I used to draw paisley on a daily basis. 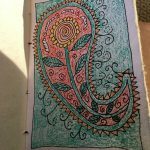 My little blank paged book and big pencil case stuffed with Lyra pencils3 were easy to bring out in airports and other places where I was forced to do nothing and I would pass the time drawing paisleys. And so I have created 5 for sale. The opportunity to own original art by Jules or gift it to your precious loved one is only $US85! Plus $2 for airmail postage anywhere in the world. And also included is the option for me, (Jules) to write a short message (40 words or less) anywhere on the card! 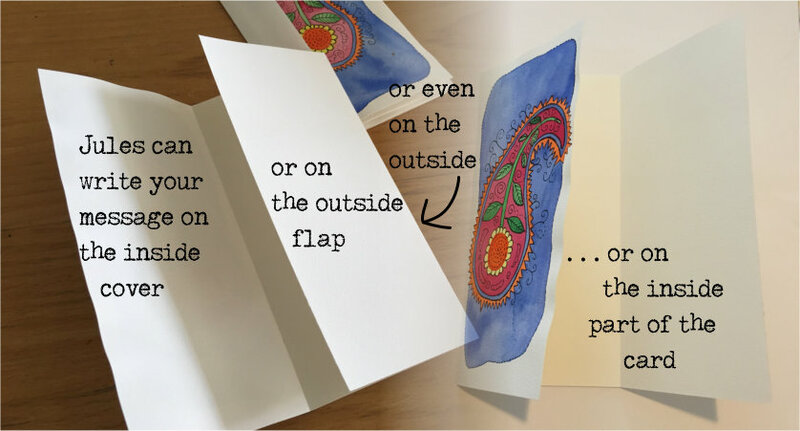 Here are the places your message could be written: the inside cover, the inside part of the card, on the outside flap, or even on the front where the design is. When you have purchased a card, you will be directed to a page from whence you can send me the text and I will be happy to write a lovely message to your loved one. It could be heartfelt words from deep in your soul, or someone else’s words: a rhyme, a quote, a spiritual text – anything at all, in my unique hand-writing which is identical to my font jules-te-reo (except not as perfect, since I am a real person not a computer). Isn’t this a perfect way for you to send a message to your loved one with a beautiful original work of art! Imagining how delighted Jules’ Art makes the recipients is so happy-making. I hope you or your loved ones love it. Yes – you can order the whole five when you are in the shopping cart if you have five special adored ones you want to spoil. (Providing none have been sold yet). Yes – they can all be sent directly to the recipient with a personal message for each one from you which has been handwritten by Jules. Please don’t delay – there are only five for sale – I may not create another run. 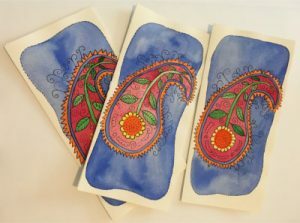 The art page links to a few samples of my latest work, including one also called Paisley Evolution. Spoonflower has a small collection of my paisley designs as well as some others elsewhere on their site. Lyra are a German brand of pencils which are chunky and colourful. They are popular in the Waldorf school system. I own every colour available to purchase. ← Fall Airily and other fabric designs.